Over the weekend the weather was so nice, and I said really strange things like, "I'm hot!" and "It's hot out here!" [pointing to the yard] and "It's hot in there!" [pointing toward the house]. WEIRD. Ah, but it did not last. Today dawns chill and pale, but since it's the longest day of the year we have a lot of time to turn that around, and they say it will happen. Sun, it seems, will be ours today, and I intend to celebrate. I finished the pattern for my new sampler and it pleased me very much! A downloadable PDF pattern and chart for the Midsummer Sprigs ABCs cross stitch sampler is now available here in my web shop. This sampler was inspired by the book The Paper Garden by Molly Peacock and the cut-paper flower mosaics made by 18th-century English artist Mary Granville Delany. Mary Delany began making her gorgeous collages at the age of seventy-two, and over the next sixteen years (until her eyesight failed at age eighty-eight) created over one thousand botanically accurate paper flowers. This sampler is my tribute to her work. I would love to have done a kit for this one but I have a lot of different things going on right now and something had to give. If you don't have a counted cross stitch shop in your area and need supplies, I highly recommend calling Jeannine at Acorns and Threads (503-292-4457), my amazing local shop here in Portland. Jeannine and her staff can get you set up with fabric and floss. This pattern calls for a LOT of different colors of hand over-dyed floss from one of my favorite suppliers ever, Weeks Dye Works. (The WDW Retailers page can help you find their flosses in your area, too — but I would call any shop they list and ask them if they have these flosses before heading out.) Since I truly intended to kit this sampler, I was not very conservative in my design and used quite a large palette. If you like counted cross stitch, I don't think it is ever a bad idea to invest in as many hand over-dyed flosses as you can manage. But they are more expensive than DMC flosses, so if your budget only allows for buying a few at a time, I've included my DMC conversions for every color in the pattern, and indicated which WDW colors I would substitute first with DMC floss and get more or less the same look. The fabric I used is 28-count Cashel linen in black from Zweigart. Their web site is under construction but the linen can be found at Acorns and Threads and also from many on-line retailers who sell it in fat-quarter cuts. (You need an 18" x 18" piece for this sampler, so a fat quarter at 18" x 27" will work great.) If you have trouble finding anything, just let me know and I will help you! Black can be a little tricky to stitch on, but Jeannine (without whom I probably never would have started cross stitching, way back many years ago when I first moved here) gave me a tip when I started this last spring: Put a white dish towel on your lap and then you will be able to easily see the holes in the fabric. It really works. 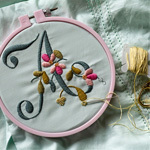 And that reminds me, if you are new to counted cross stitch, you may want to read my tutorial on it to get you started. I am so enjoying the new colors that have been appearing in your photographs. Lovely greens. It makes me happy, thank you for sharing them with us all. So cute. That sampler is just soooooooo cute. it is a lovely world. gorgeous photos. Your photos have an elegance and peacefulness about them. oh, 'tis lovely, Alicia! Thanks for making the pattern available. :) and acorns and threads is only 10 minutes from my house, yay! Enjoy the summer solstice. a budget friendly alternative. Although I will have to go with the WDW version. As for hot, it's been hot here inTX and we have a few more months of it to look forward to. Or not! Thanks for the dishtowel tip. I need all the tips I can get as a fledgling. Enjoy the longest day. We finally have sun too and it feels amazing. Absolutely gorgeous. I've loved seeing the snippers as this has evolved and the finished piece does not disappoint. Glorious colours and a great alaphabet too. happy summer, alicia. there is an eerie grey light blanketing omaha today. i'll take a bit of your sunshine, thank you. yay! i have been waiting patiently for this one. :) lovely, lovely pattern. i am in the "other" portland (maine) and it is very hot today and humid. and i find i am saying the same types of things...i am also painting my kitchen cabinets, but need to allow more time for things to dry (with the raised humidity) and think i will start a new cross-stitch to fill that extra time. thank you! Love your sampler, and the black background gives it such drama-love that! Really enjoyed the background on your inspiration story. I do find so much inspiration from people who achieve great things later in life....Fab photos, as always. Just perfect. Beautiful! Not only the cross-stitch, but the words and photos to go with it. I'm hoping to try this one sometime! It's been soooo hot here in Michigan, had to cut garden plans at least two weeks short because moving any more plants just wouldn't be fair to the poor babies. Also putting lawn care on the August/September schedule (ie cut only about every ten days) because we seem to be in a drought here as well. Sooooo--you guessed it--more time to stitch! Can't wait to be able to start on this sampler, altho I will guiltily admit that I've got a couple of modifications planned, as I do with 95% of the pieces I stitch. Throwing myself on the mercy of the Posie fan club/community...your designs are so sweet, but I just can't help the urge to add my own touch!! It is so blue blue blue here today and it was nice to see your lovely fresh looking photos - the peas, the yogurt, the wicker - all so summery! I like this sampler so very much...I enjoyed the book you reference also...So much rain here in Northern Wisconsin and Minnesota doing terrible damage to roads, homes, and zoo animals...your blog is a bright spot in any day, but especially on days that are harder...blessings to you and yours. A lovely world indeed...and you capture it so well in your photographs. Alicia, the light in your photos is always just gorgeous. I'm trying to break out of the auto mode on my DSLR, and you've inspired me! Thank you for all the beauty you bring to our world. Vanessa Diffenbaugh? I'm only about 8 chapters in, but I'm hooked. It may sound a bit weird (since we don't know each other!) but as I was reading it yesterday, I thought you'd like it, too. If you're looking for a new read, give it a try if you haven't already. Happy Summer! Your sprigs sampler reminds me of a nordic legend. (There truly is such a legend; you can google it. )The legend says that any woman who washes her face in the morning dew of Midsummer's Day will grow lovelier through the coming year. Midsummer's Day is June 24th, so mark your calendar! Go out into the garden in the early morning and pick a dew-covered rose and gently rub the petals and dew on your face. It's a lovely feeling, indeed. Your breakfast looks delightful! You've created a beautiful reminder of how important it is to serve with love and respect one's self. The garden is just getting prettier with each photograph you post. Looking forward to working on the cross stitch!!! 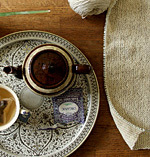 I made your woodlands sampler, and I love this new one, also-totally want to make it. On your March 12 post this year you had photographed this sampler in progress on a rich brown linen. Could you please share the info for that fabric, such as the color name and manufacturer? Thanks so much! Love the sampler . . . it has been years . . . I like the black, just may have to begin again . . .